RHEED (reflective high energy electron diffraction) is a powerful tool to monitor the deposition of thin films. An electron beam hits the substrate/film at a very small angle to the surface, so the electrons don't penetrate deep into the material. Diffraction takes place in the top few atomic layers of the sample, so the resulting diffraction pattern contains information about the film surface. 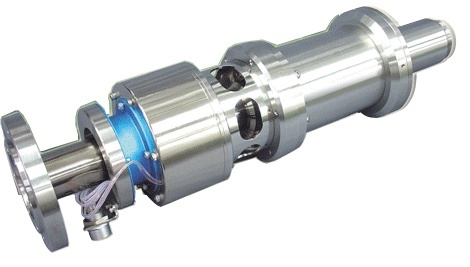 RHEED works well in UHV processes like MBE (molecular beam epitaxy), where the chamber/process gas pressure is low – typically below 10−6 Torr (if you are interested in a solution for higher process pressures, check our high pressure RHEED system). RHEED is a real-time method, allowing to monitor the deposition of single atomic layers. The diffraction pattern contains information about the in-plane lattice spacing of the sample surface, but also about the surface quality. Patterns for perfectly crystalline and flat surfaces consist in diffraction spots arranged on circles, for typical high quality films the spots transform into elongated streaks, and if the surface becomes rough (but still crystalline) the streaks fall apart into a series of spots to form a transmission-like pattern. For applications where the electron beam current normally applied in RHEED systems is inacceptable due to sample damage, e.g. in organic thin film growth, refer to our PICO-RHEED system. Beam spot size: 90 μm diameter max. Acceleration voltage: 0…−30 kV constant voltage supply, ripple 0.03% max. Filament voltage: 0…5 V constant voltage supply, ripple 0.05% max. Filament current: 2 A max. Deflection lens supply: 0…1 A constant current supply (±1 V), ripple 0.05% max. Focus lens supply: 0…1.5 A constant current supply (0…22 V), ripple 0.05% max. For more information, visit the R-DEC Co., Ltd. (Japan) product page.